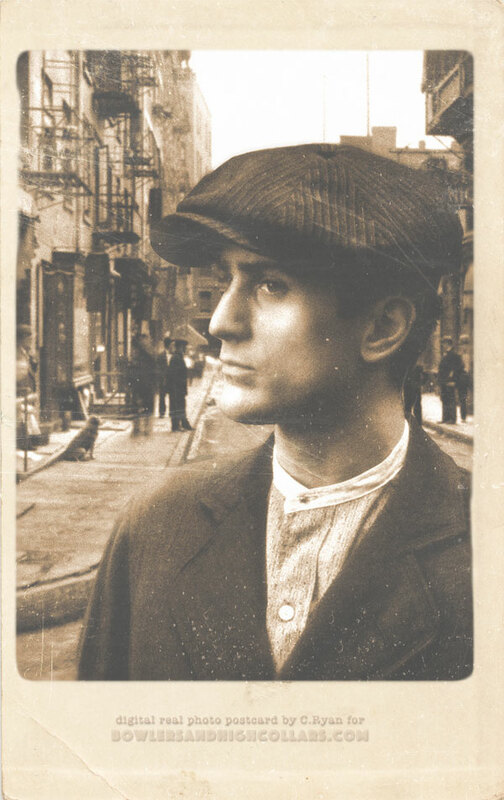 This entry was posted on Wednesday, November 11th, 2015 at 11:24 pm	and tagged with 1910s, New York, photo manipulation, robert de niro, The Godfather and posted in digital art, Gentlemen. You can follow any responses to this entry through the RSS 2.0 feed. Thanks! I found it funny that usually I up the contrast of real photo postcards while here I purposely did the opposite. It was very successful and a great idea. I think you could develop this into a great project. Start a new blog! I have three. Only two that are active at the moment. I don’t think I’ll do them often enough to justify a new blog, but I could add a category for now. Hehe! If I really get into it and get enough feedback I’ll certainly start a new one. This one seems to be taking off on tumblr so that’s a good sign.